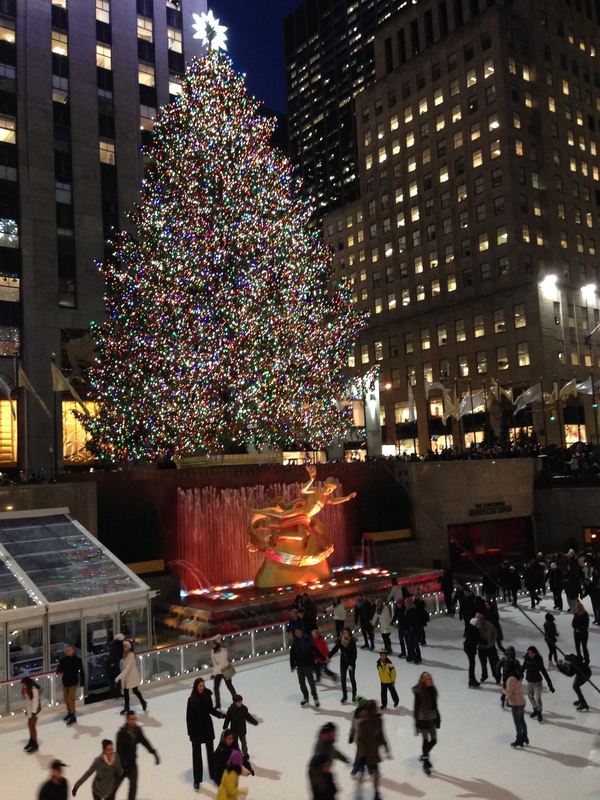 One of the conditions for me living in Tampa is that the Husband has to take me to NYC every Christmas (well, the ones I don’t have to work anyway). Since I worked last Christmas, this was my year to have it off! So of course we went to the city. We flew JetBlue, which we don’t normally fly but thought we would give it a chance. Our airport has two terminals, red and blue. We almost always fly out of the red terminal, usually airside C. It has the delicious Cigar City Brewery (the Florida Cracker is my favorite!) and Shula’s, where the bartender pops open a split of Chandon as soon as he sees me walking in. JetBlue is housed in airside A, part of the blue terminal. The options aren’t as good (just my opinion) but they may just be because I’m so used to airside C. I was pleased to see that there is a Green Iguana there now. We settled down at the bar, which is inset in the ground so the bartenders are a step down and the seats are normal height. 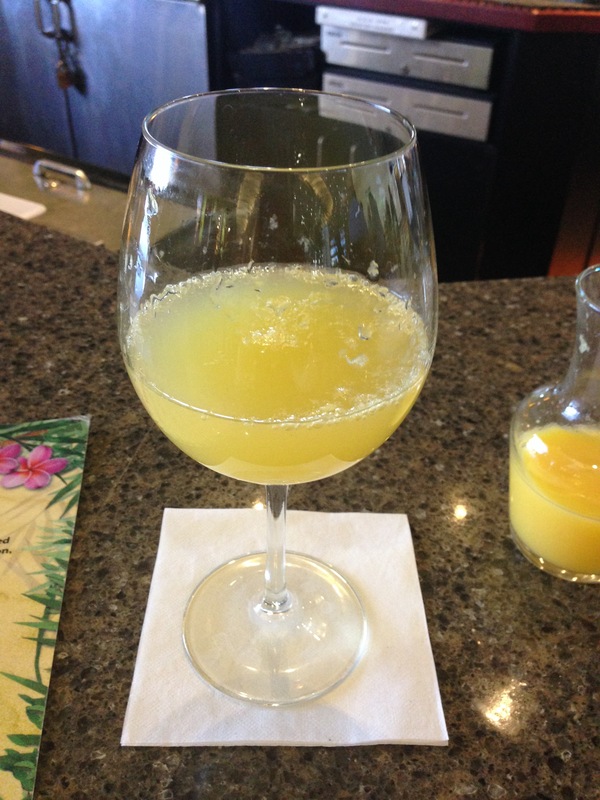 I ordered my customary sparkling wine, but since it wasn’t Chandon I ordered it with a side of orange juice. Cheers to the start of our trip up north! We boarded our nonstop JetBlue flight feeling brave and excited (thanks to the sparkling wine and xanax). Our flight was nice and smooth and the Husband loved being able to watch TV. It keeps his flying anxiety to a minimum. Instead of staying in our normal neighborhood, we decided to venture to a different area of the city and stayed at the Avalon Hotel in Koreatown. At first we were impressed with the hotel. 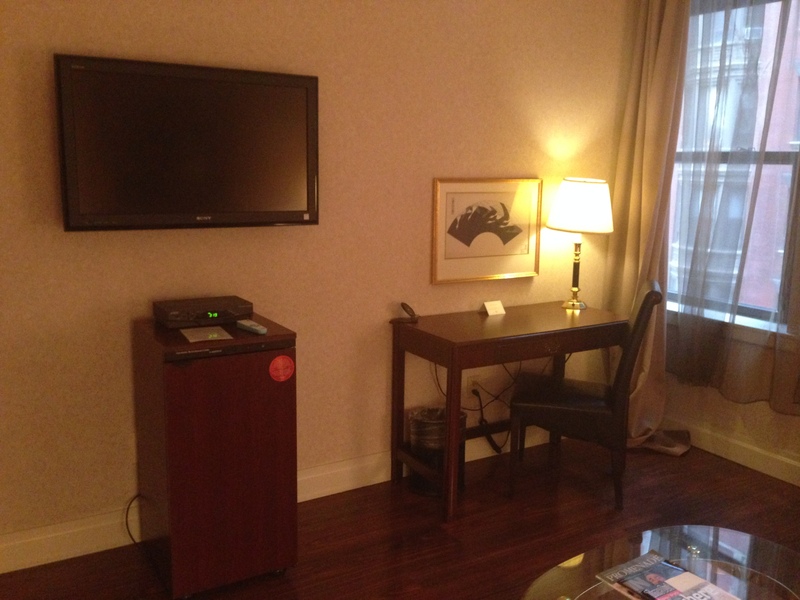 Pretty reasonable rate for the city, easy check in, pretty lobby. 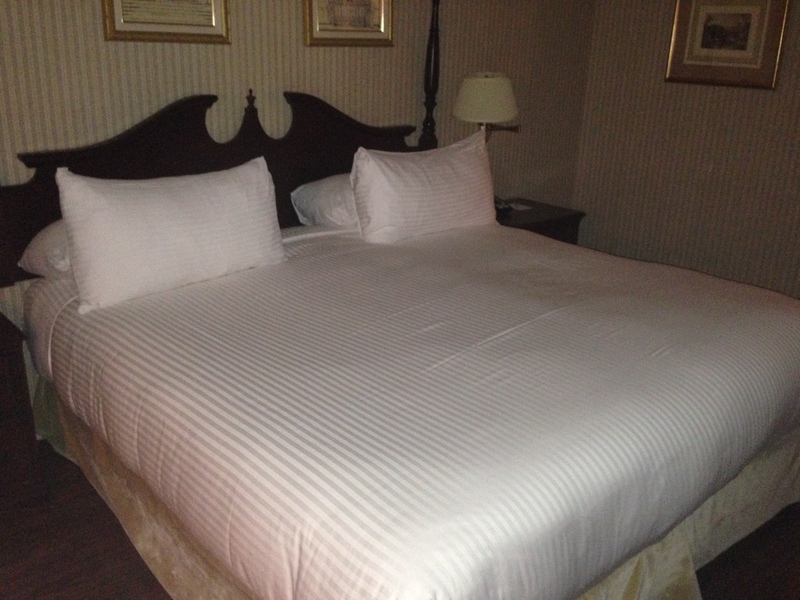 The room was nice, and honestly a little too spacious for our needs. 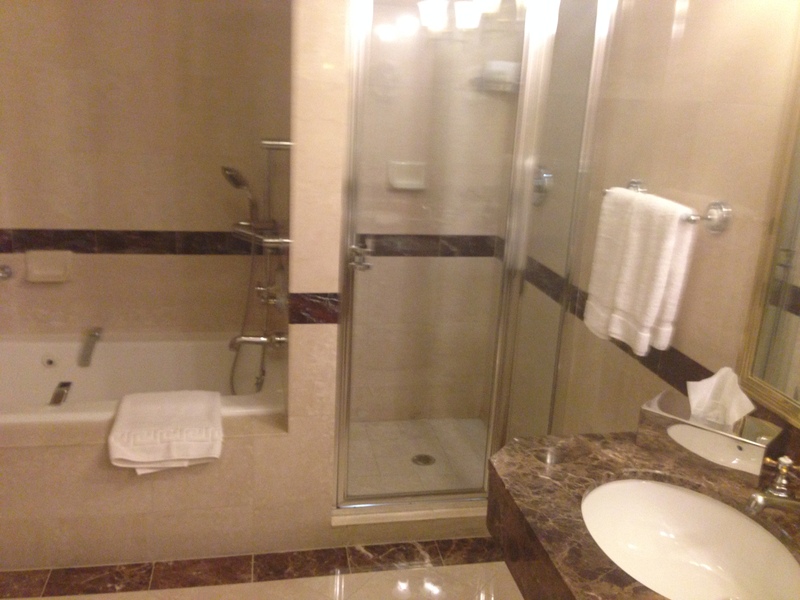 But it was nice having the living room and the huge bathroom. But then the experience started to go downhill. 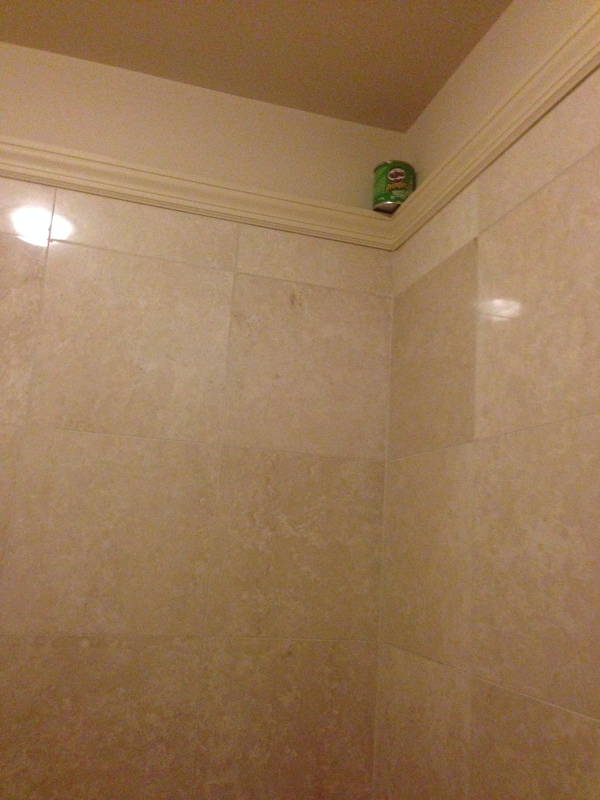 One of the first things we noticed was a Pringles can propped up on the molding by the ceiling in the bathroom. We decided to leave it there because A) I was afraid of what could be in it and B) I kinda wanted to see of the housekeeper would notice it and take it down. 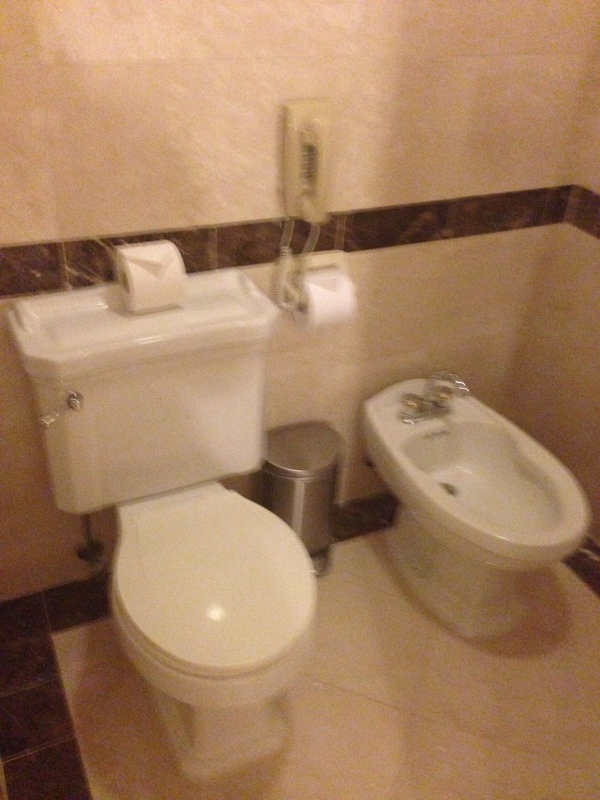 It was still there when we checked out, despite me even tweeting a photo of it to the hotel. We also seemed to be smack in the middle of a renovation. 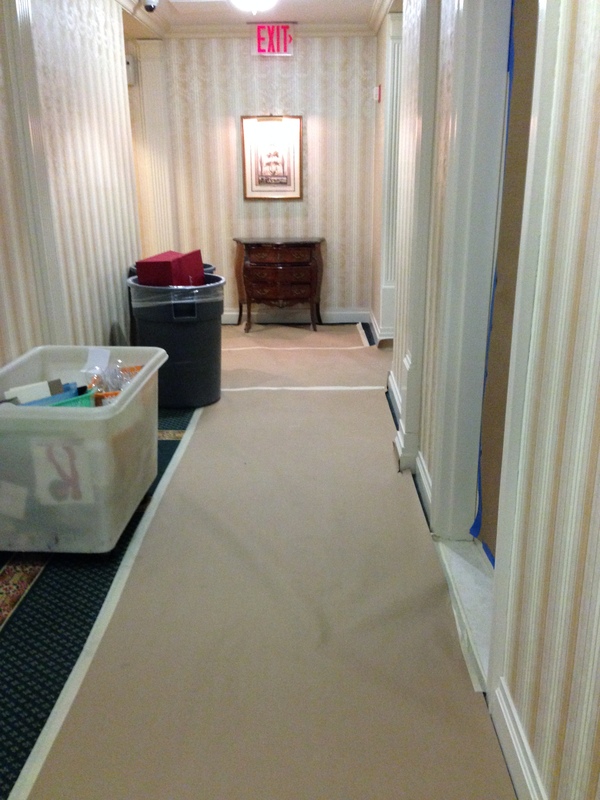 It seemed every room around us was being worked on, which was especially unnerving after a night of drinking with old friends. Our room is right before that plastic bin. 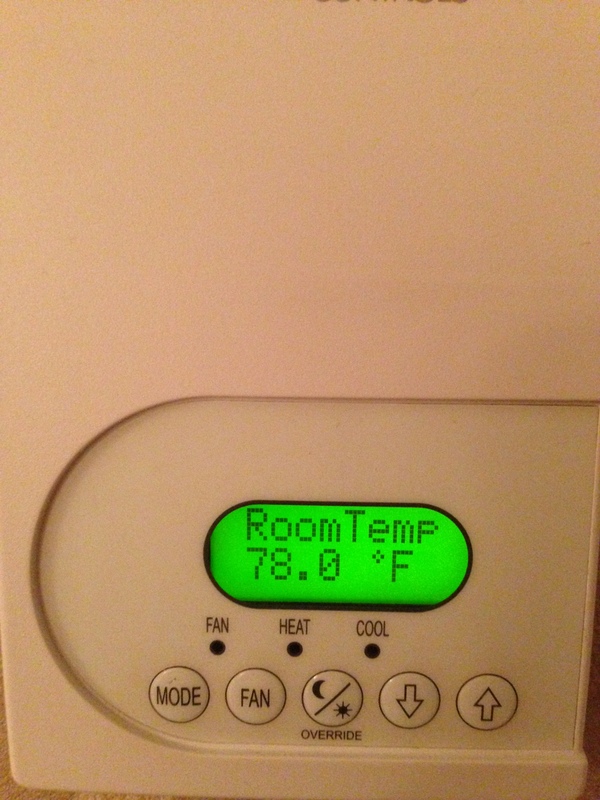 The last night we stayed, the thermostat seemed to break. It was 78 degrees in the room, and only got hotter. The first person to come fix it told us to just turn it off. OK, sure buddy, lets see how that helps… Twenty minutes later, it was ever hotter. So the doorman came back up and opened our window. We all know hotel windows don’t open more than a few inches, and one of the windows wouldn’t open at all. So of course it didn’t get any cooler and now we had the loud Saturday night noise of Koreatown to listen to. Obviously, we didn’t get much sleep. When I tried to mention the issues at checkout the next morning, the worker didn’t seem to care. I called to speak to a manager three days ago, and still haven’t gotten a call back…. But enough about our crappy hotel stay. The location was pretty great. 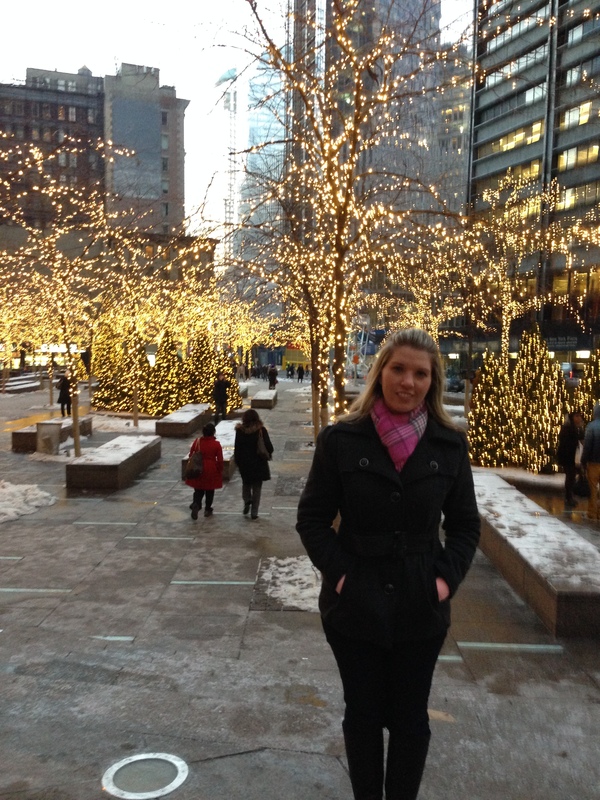 Close to the trains, walking distance to lots of trees, and no where near Times Square (I despise Time Square). Our first order of business was Papaya Dog. I had one with everything, the picky Husband had one with nothing. We took the train down to our old neighborhood in the Financial District and did some shopping at Century 21, the greatest store in the history of the world. We had drinks at our old hangout Ulysses and walked to the South Street Seaport. 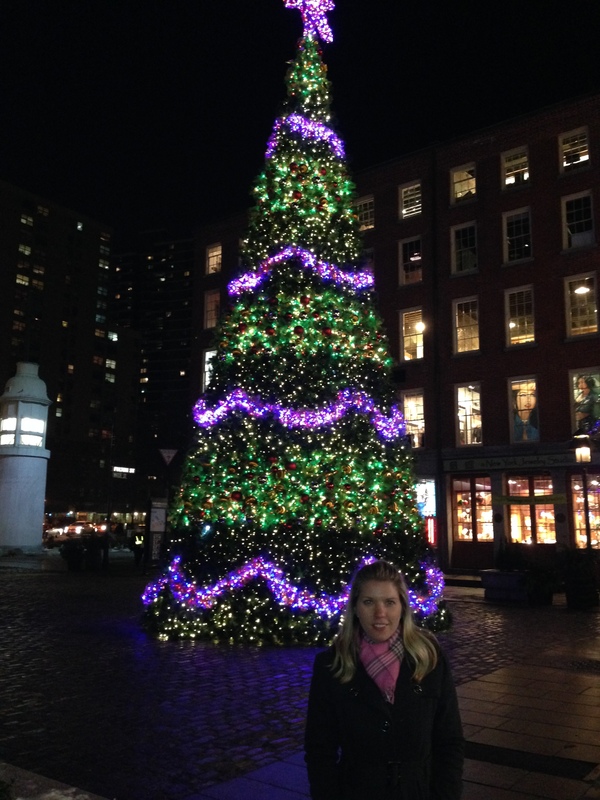 I think the Husband was a little cold when he took this photo of me and the Wall St tree. We learned that the pier at South Street Seaport was closed due to the damaged caused by Hurricane Sandy. It made me really sad in my heart. We spent a lot of time there when we lived there. One summer, they had an artist but waterfalls under the bridges, and it was so nice to just sit around with a book, looking at the waterfalls. 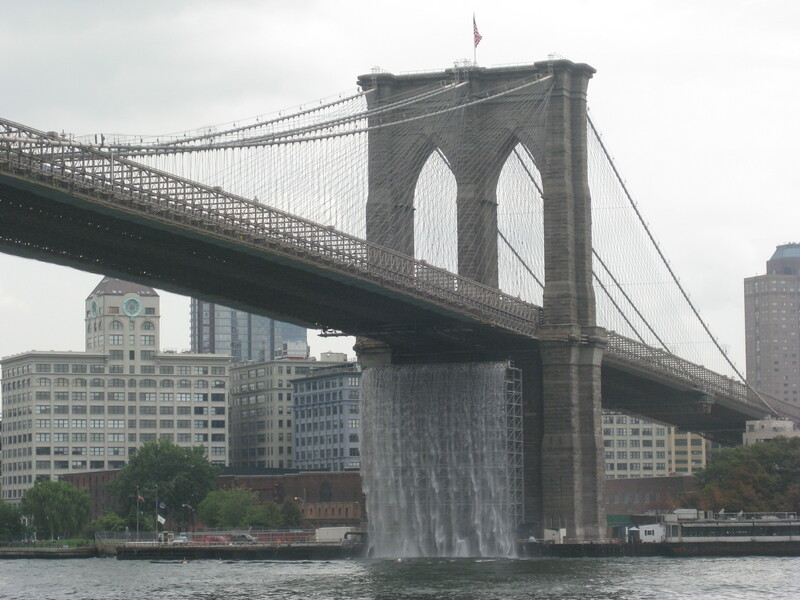 Waterfall from South Street Seaport, circa 2oo8. Once I was done boohooing, we headed to Chelsey, where we met up with some old friends and celebrated life with champagne. Lots of champagne. 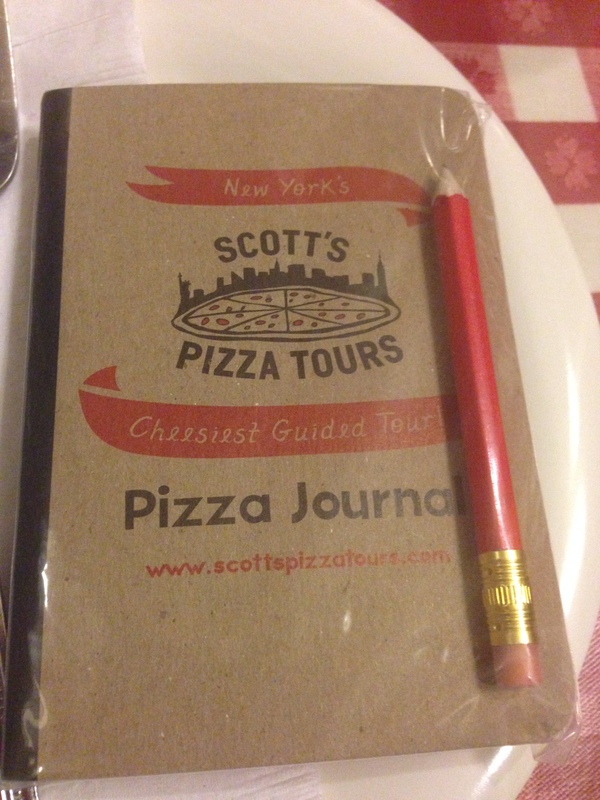 We went on Scott’s pizza tour while we were in the city. We went to three different pizza places, had awesome pizza, and learned a lot about the process of making pizza, and how pizza came about. Super interesting to my nerdy self and super yummy. They even gave you a little notebook to take notes in. 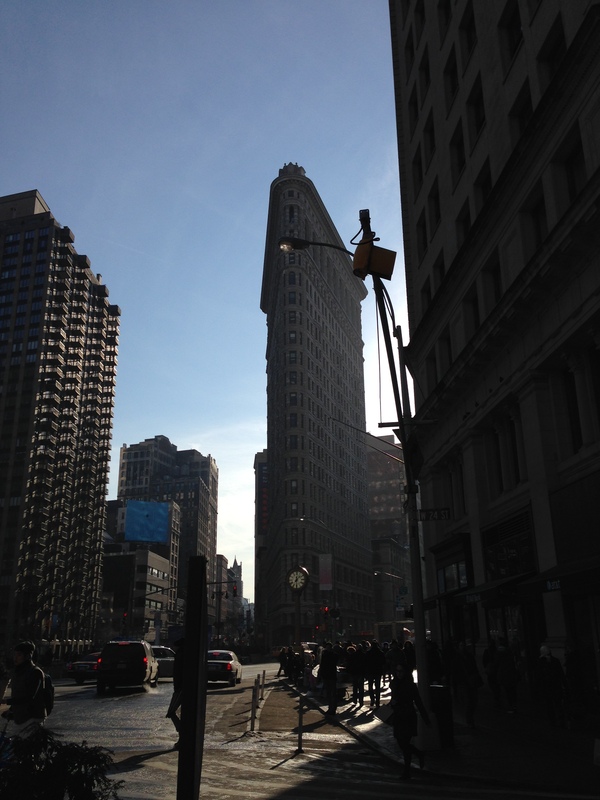 One of my favorite buildings in NYC is the Flatiron building. I love the details, the shape, the location, everything. 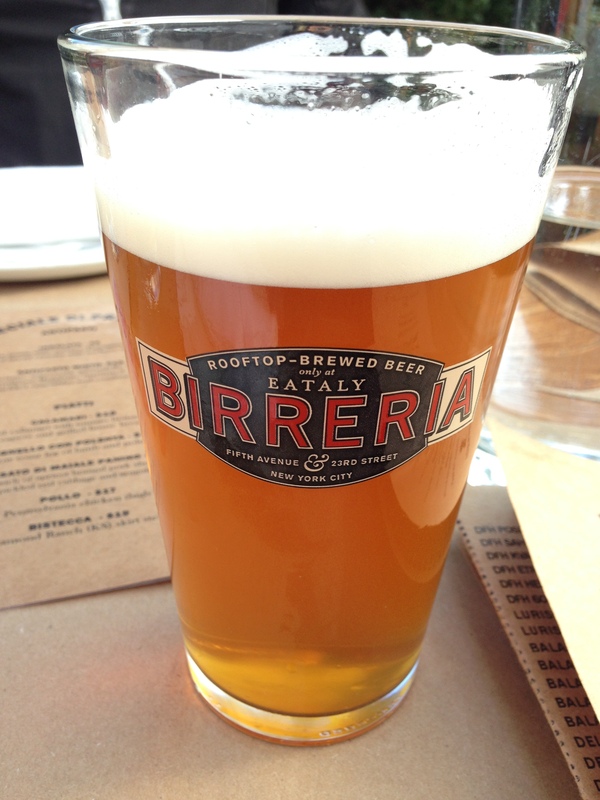 We discovered an awesome place called Eataly, buy the Flatiron building. 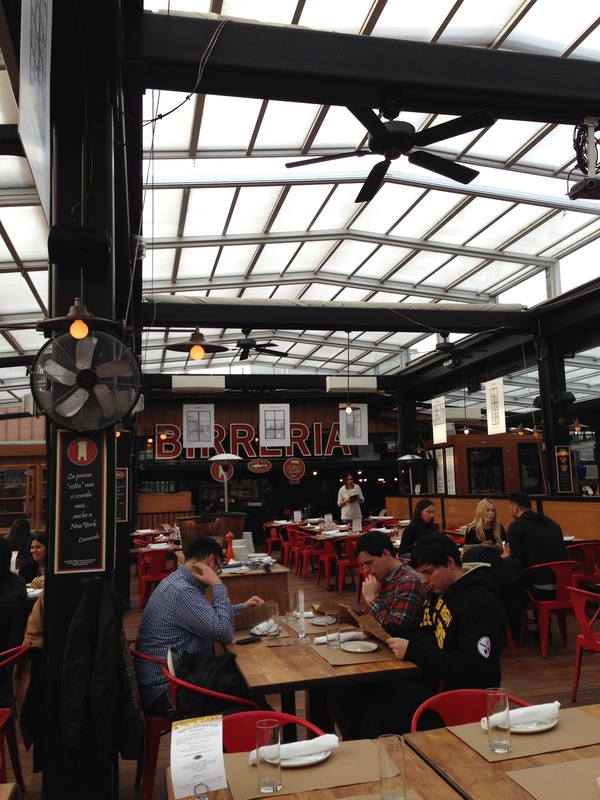 It is this huge place with gelato, pizza, wine, groceries, paninis, books, cooking supplies, you name, they have it. And on the roof was an awesome restaurant and they brew their own cask beer. Cask beer that was actually quite good! 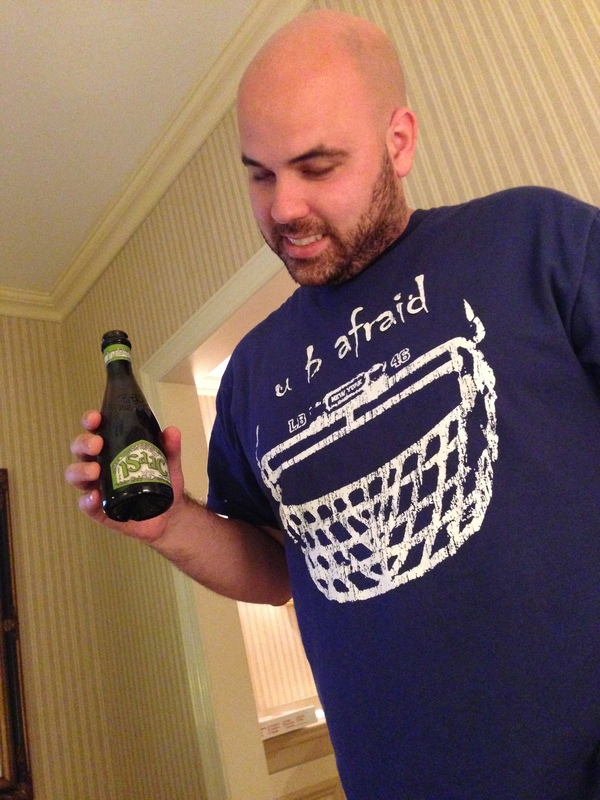 They even sell a beer called Isaac, so of course the Husband had to try it. 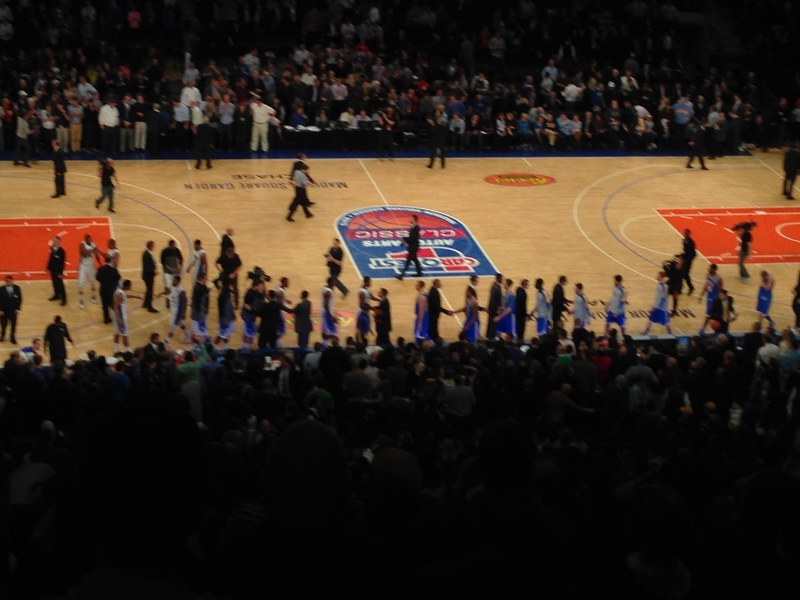 Later that evening we went to Madison Square Garden to see the Husband’s favorite college basketball team, Duke, play. This was a big wife moment for me, since I hate basketball. I can’t stand the sound of the sneakers squeaking on the court. But I went. And it wasn’t terrible. In fact, it was so tolerable that the Husband convinced me the next day to go see his alma mater, the University at Buffalo, play basketball at the Barclays Center. The Center is pretty cool but the game was terrible. Thankfully the Husband let us leave at halftime. Of course we went to Rockefeller while we were there. 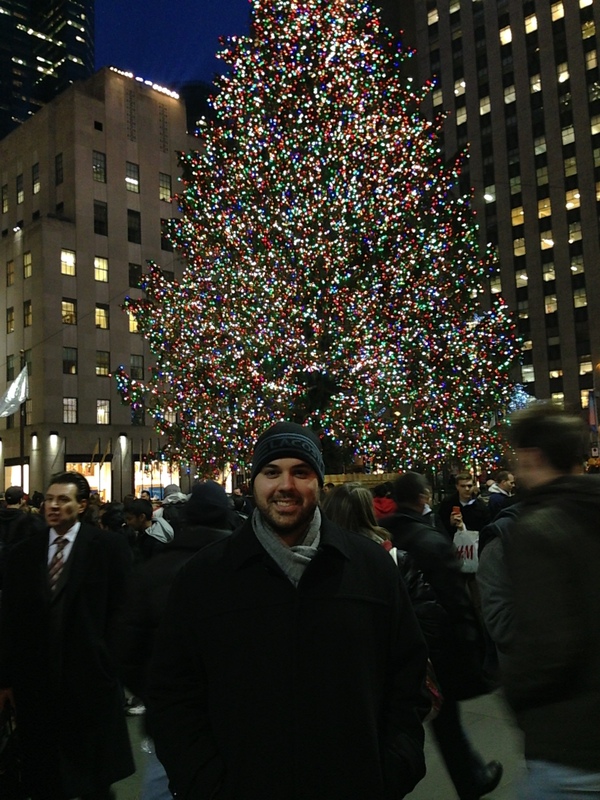 You cannot go to the city at Christmas and not go see the famous tree. 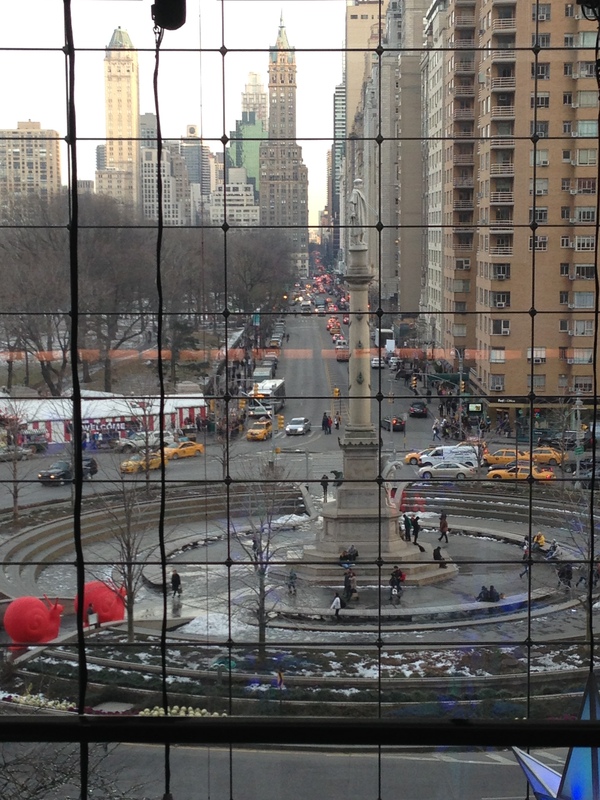 We stopped by Columbus Circle, near where we got engaged, and had a drink and enjoyed the awesome view. At the little market we discovered the heaven that is Wafels and Dinges. They are these delicious waffles with some amazing spread on them and I’m in love. So much that I didn’t even waste time taking a photo. 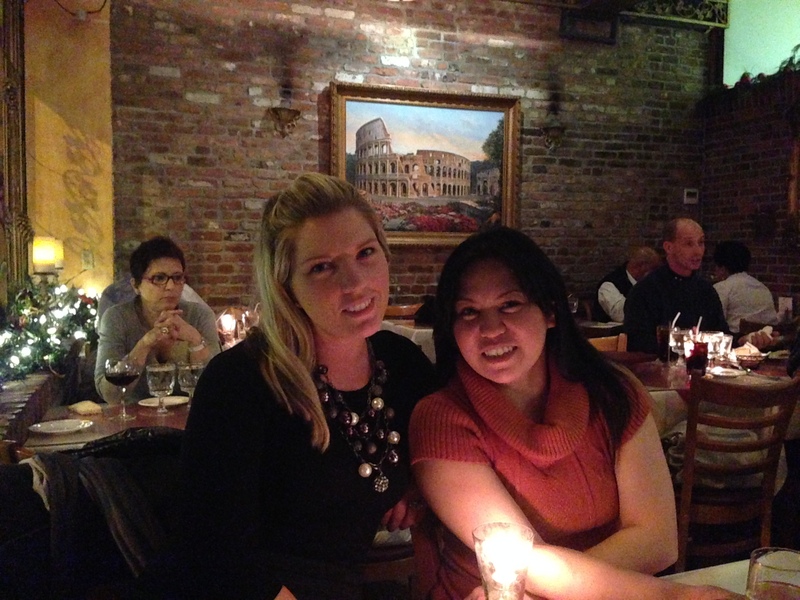 After our wafel, we headed to Little Italy for dinner with my friend Billie. 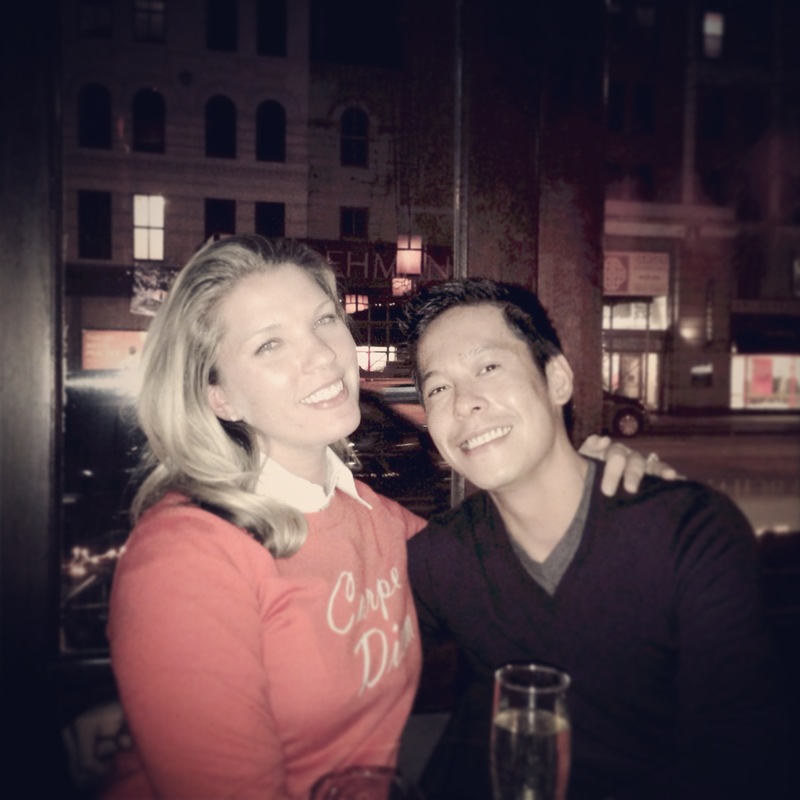 It’s always so fun catching up with old friends, especially over awesome Italian food and good wine. After dinner we headed to a place practically next door to our hotel, where there is a club in the basement. 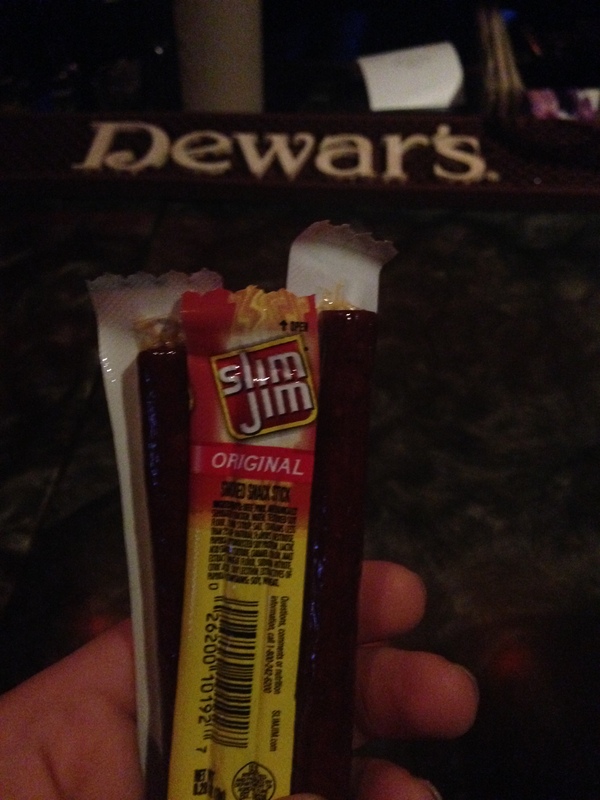 I ordered a glass of wine, and it came with a handful of Slim Jims. 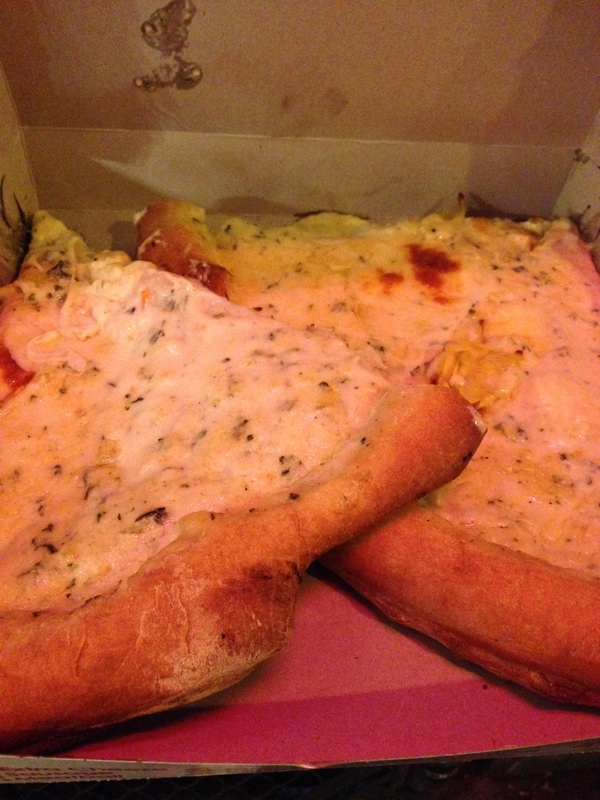 Before we took the Amtrak to Rochester, I stocked up on my favorite NY pizza, Artichoke pizza. 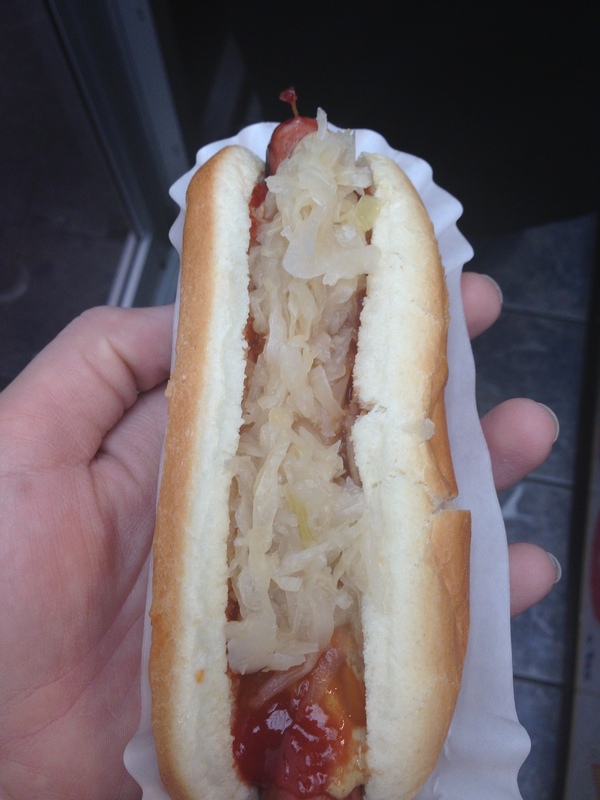 Now, if you have never had it, then you now have a reason that you absolutely must go to NYC. You can’t find anything like it anywhere else and it is just amazing. Now that I had my pizza and saw my friends, I was ready to head to my family for Christmas. We took the Amtrak to Rochester, just like we used to do when I live in NY. Goodbye my love, until we meet again! We spent the rest of the week in western New York with our families. 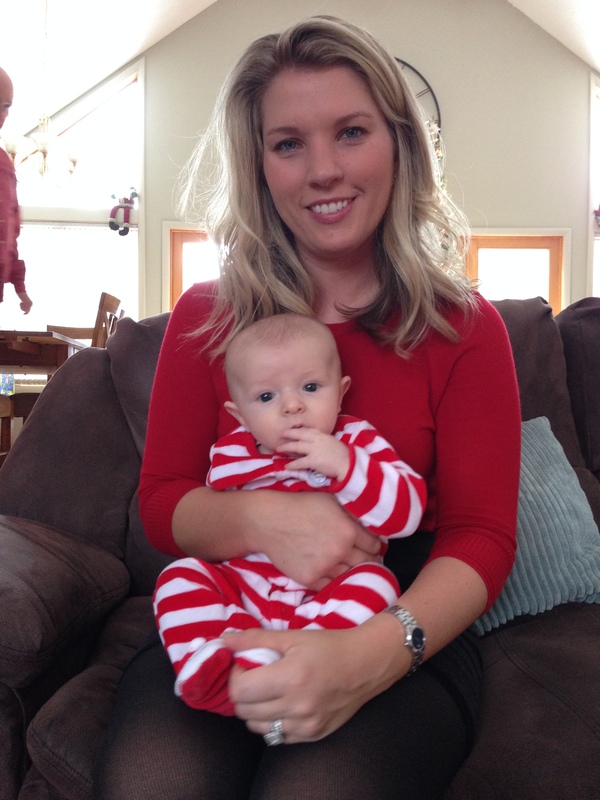 I have a new nephew that I am pretty much obsessed with. Pretty when the sun is out. I was able to see most of my family and friends. 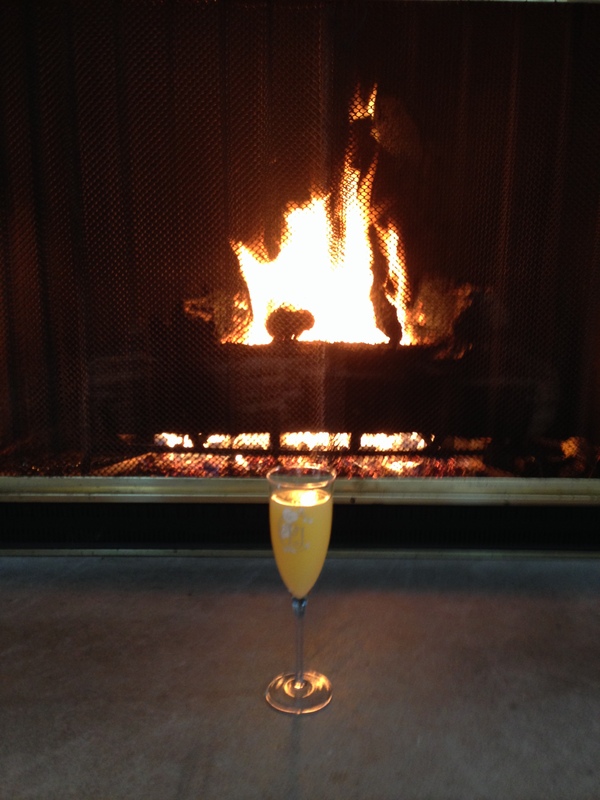 I didn’t go skiing or make a snow angel, but I did drink champagne by the fire. How warm and cozy is that?! My father lives in the Finger Lakes wine region. I’ve always wanted to go to Casa Larga winery, which is seriously 4 miles from his house. And I finally went. 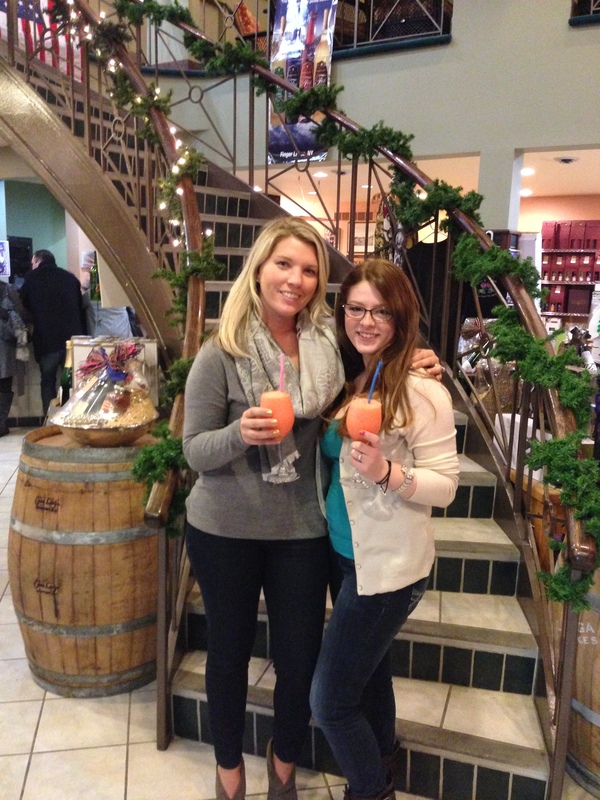 Wine slushies with my future sister in law! 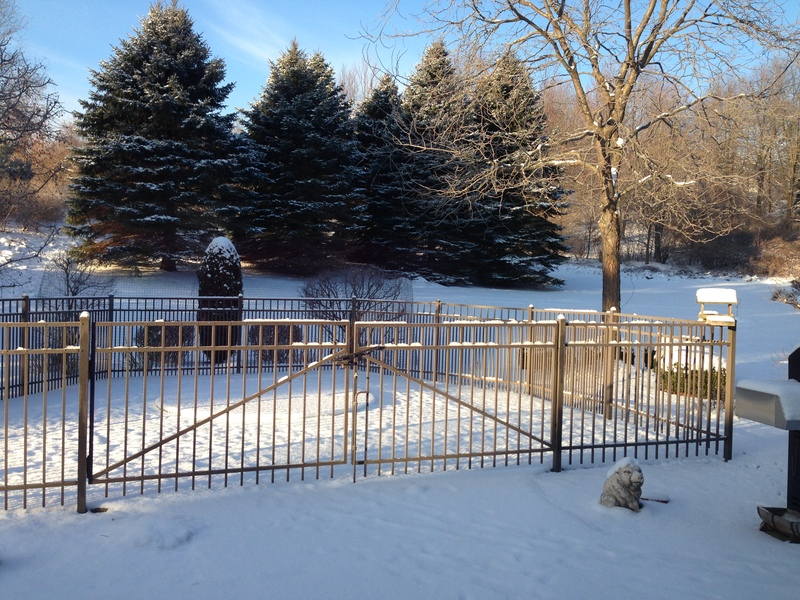 I’m not going to lie, was I glad to go home to warm, sunny Tampa. I had enough runny noses, sore throats, and cold toes. I was sick of drooling on myself because the air was too dry to breathe through my nose. 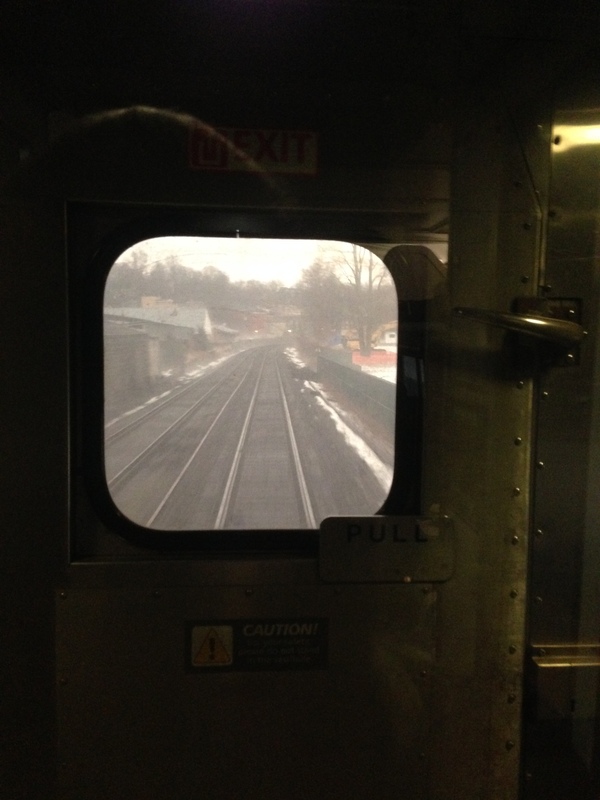 For the first time, I was ready to leave NY. Wow! What a fun and beautiful trip despite the few slips at the hotel. That weird can of Pringles was crazy weird!! lol. I’m so glad the rest of your trip was fun and that you got to see lot of pretty sites, and of course, family and friends! It was a great trip, despite the hotel!